A 'lone wolf' dissident republican, the suspension of school pupils over drugs and the departure of a key political strategist are among the main stories on the front pages on Thursday. Christine Connor, 31, pleaded guilty to the attempted murder in north Belfast of a police officer and other terror offences on Wednesday. 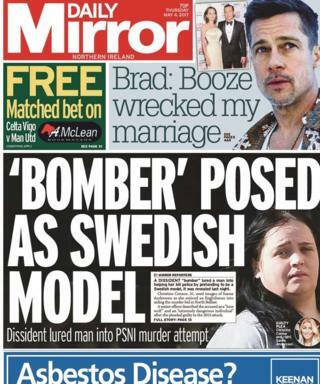 'Bomber' posed as Swedish model is the front page headline in the Daily Mirror. The court heard that Connor lured Stuart Downes, from Shrewsbury, into her plot by using a fake online profile, including a fictitious name and photo that "bore no resemblance to her". Mr Downes was arrested, questioned and charged with a series of offences linked to the May 2013 attack but took his own life last year. The Irish News reports on a fatal road traffic incident in Warrenpoint, County Down, which involved a lorry shedding its load. It says Keith McWilliams who was walking his dog on the Rostrevor Road, died in the incident. The newspaper says Mr McWilliams, who was described as "well-known and popular", had moved to the town around 30 years ago with his wife. He was originally from the Newry area. One of Northern Ireland's leading schools, Campbell College in Belfast, has suspended six pupils over "two isolated incidents" involving cannabis, the Belfast Telegraph reports. Headmaster Robert Robinson said the school's policy on drugs is "robust" and that it believed "in tackling these issues head on". The school confirmed it had taken action against the Year 10 and Year 12 pupils. Cannabis also features in the Daily Mirror, as it reports that one Londonderry man grew a personal supply of the drug as he said it was too expensive for him to buy on the black market. Seamus Harkin, 34, was fined £500 after he pleaded guilty to a charge of cultivating cannabis in his flat in the Waterside area on 9 January. The court heard police found grinders for breaking down the drug in the living room. A tent containing 100 cannabis cuttings in pots were found under a strong lamp on the floor of a bedroom. 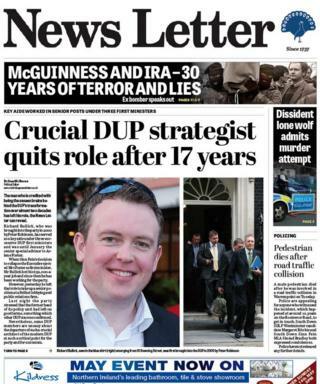 The News Letter leads with the story that key DUP strategist Richard Bullick has left to take up a senior position at a Belfast lobbying and public relations firm. Mr Bullick served as an aide to three successive first ministers. The newspaper's political editor Sam McBride says the party stressed that the former head of its policy unit had left on good terms. The Irish News reports that an Irish language primary and nursery school in west Belfast has suffered three break-ins in as many days. Windows were broken and the office at Bunscoil an tSléibhe Dhuibh was ransacked during the incidents. Up to £10,000 of damage has been caused, but principal Pilib Mistéil said "classes were continuing as normal". Educational establishments also feature in the Belfast Telegraph as it highlights fears that students from Northern Ireland who attend universities in the Republic of Ireland may face higher fees post Brexit. There is currently a capped charge of 3,000 euros (£2,500) at Irish universities for European Union students. The newspaper says concerns have been voiced that when the UK leaves the EU, Northern Ireland students could face significantly higher fees. Fianna Fáil TD Thomas Byrne says the Irish government needs to deal with the issue quickly to reassure students. Student leader Fergal McFerran also wants the matter addressed. On a lighter note, a friendly fox with a penchant for sweet snacks has been causing a stir on the greens of Lisburn Golf Club, the News Letter says. The valiant vixen does not appear to see human activity as a handicap, more a great opportunity to score free meals for her and her family of cubs. "I was playing in a competition with a lady from Warrenpoint," Sandra Leckey said. "We were teeing off at the 14th and when we got down this wee fox appeared. "She was very thin and looked very hungry so I gave her an Alpen bar and she took it." Is 'buying' a baby ever OK?